Is Your Lease About To Expire? If your lease is about to expire and you aren’t sure what to do next with your Honda vehicle, let us make the process a little easier for you at Harrisonburg Honda. So you leased the Honda of your dreams and the terms of your lease are about to expire. Now what? You may have questions about what to do next and how to go about returning your leased Honda vehicle. We want to take the time to answer your questions and help make the process a little less stressful at Harrisonburg Honda. When your lease expires, it can be confusing as to what you should do next with your Honda vehicle. You have a few options when it comes to this process. You can choose to return the vehicle to Harrisonburg Honda and lease a new Honda vehicle. This is simple. You will schedule a free vehicle inspection within the last 2 months of your lease. The Honda Leadership Leasing includes a $500 excessive wear-and-use or damage waiver. Loyal customers may be eligible for additional waivers and get their turn-in fee waived. You will be responsible for any additional mileage, damage or outstanding obligations to your lease. You can also choose to simply turn your vehicle back to Harrisonburg Honda. The same terms apply. Finally, you can choose to purchase your leased Honda vehicle. If you choose to purchase, you will not be charged for excessive mileage or damage. I Have Made My Selection. What’s Next? Now that you have made your lease-end selection, what should you do? If you are simply turning in your lease and not purchasing a new car or your current vehicle, simply fill out the form below and we will be in touch. If you are keeping your leased Honda, we still encourage you to fill out the form below and we will begin the process. If you are searching for another Honda to lease, check out our inventory and once you have selected the vehicle of your dreams, fill out our online credit application as well as the form below so we can begin your new lease process. If you have any questions along the way, we are here to help by phone, online, or in person at Harrisonburg Honda today. We are so honored that you leased your vehicle from Harrisonburg Honda. We know you could have gone anywhere and we do not take this honor lightly. We are here for you to help you understand your options as well as get you the best deal around. Check out our inventory online or on our lot and let us know when you are ready to move forward. Our team is here to navigate you through the leasing process and make the lease return as painless as possible. Be sure to begin this process early so you will have no surprises and you can begin making decisions as to what you want to do after your lease is over. 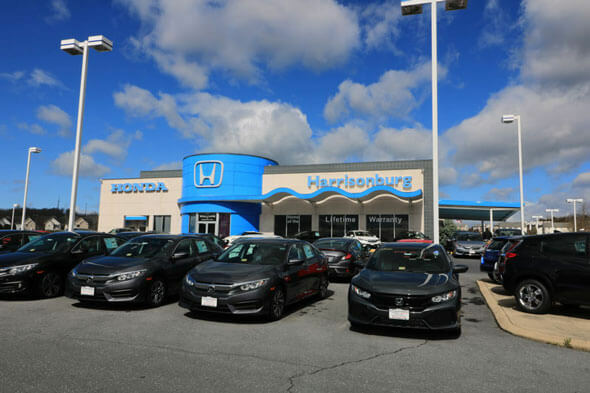 We are here to answer your questions so don’t hesitate to reach out to our team at Harrisonburg Honda. When your lease end date is getting near, Harrisonburg Honda will help you through the entire process. Submit the form below or Contact Us today for more information!